Wheat shipped to United Grain Corp., wood chips headed to the paper mill in Camas and other commodities are expected to arrive to their destinations, but the wildfires in the Columbia River Gorge may lead to some delays. The U.S. Coast Guard on Tuesday enacted restrictions between the Bonneville Dam and Reed Island, near Washougal, to help barge traffic safely pass the 30,000-acre Eagle Creek Fire. Barges carrying everything from grain, refined petroleum, gravel and rocks now stop on either side until Coast Guard officials say it is safe for them to move to their intended destination. "If we were to allow vessels to go through and we had an incident where some hot embers light off the cargo on board or there was a collision between a response aircraft and the vessel, not only do we potentially put lives in danger but the cargo at-risk, and the potential river itself if there's a pollution incident," said Chief Petty Officer David Mosley, a Coast Guard spokesman. Given that it's a fairly narrow stretch of the Columbia River, he said, officials want firefighting operations, which include aircraft carrying water, to be able to operate without having to worry about any watercraft from barges to kayaks. "We work to understand the conditions at the river and what operations are going on with firefighting," he said. "Our biggest concern is the safety of the vessels and the crews." Personal and recreational watercraft have been prohibited from the area. Twenty commercial vessels had made it through the restriction zone by Thursday afternoon. Barges and tugboats, which freight good between inland ports as far as Lewiston, Idaho, and deeper waters like those around Portland and Vancouver, would see those impacts first-hand. Tidewater Transportation and Terminals, based in Vancouver, and Shaver Transportation, of Portland, both said they had crews halted for only briefly. The delays have not led to any substantial impacts. "It was maybe a day to a day-and-a-half delay for us," said spokeswoman Jennifer Riddle. "It's just a delay. Not that the fire wasn't a huge happening, it was just a delay for us." Rob Rich, vice president of marketing with Shaver, agreed. "The best way to put it is that commodities that are transported by barge will continue to be transported by barge," he said. "We do not foreseen any losses." Rail transport was impacted slightly. The Union Pacific Railroad, which freights on the river's Oregon side, put the brakes on shipments from late Sunday through Wednesday. The rail company ships some to the Port of Vancouver, but not as much as BNSF Railway, which could not be reached for comment. Union Pacific trains haul "anything that's packaged according to U.S. Department of Transportation standards," across at least 20 trains a day, said spokesman Justin Jacobs. No financial impact could be reported. "I know it's a vital artery for us, for Union Pacific in Oregon," Jacobs said of the railroads along the Columbia River. Though trains are running again, Jacobs said they are going slower and crews have been told to run more inspections prior to getting underway. United Grain Corp., a grain exporter located at the Port of Vancouver, said the delays have already cost them thousands of dollars and pushed back previously scheduled maintenance. "However, we realize some delays are unavoidable," the company said in a prepared statement. 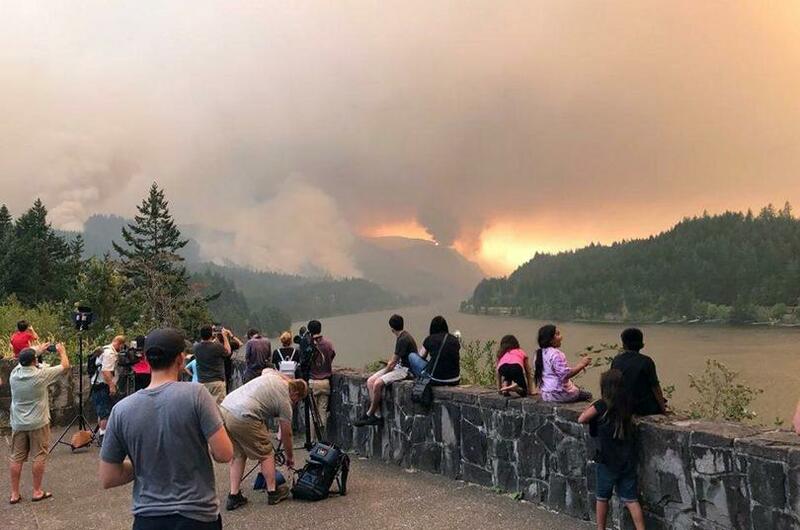 "This massive destruction to our beautiful Columbia River Gorge is devastating and our thanks and appreciation goes out to those fighting this fire."